Once serving as Soviet coast guard barracks, the estate has now become the pearl of North-Estonian coastal cliffs. The story of the restoration of Saka Manor began in the summer of 2001, when the Estonian government held a public auction and sold the main residence to a private owner. There had already been two earlier but failed attempts to sell the building. The new landlord was Tõnis Kaasik. This is his story: “In that moment, my decision was influenced by emotions and the 30-year-old memory of a day spent in the yard of the manor when a border guard detained me. The story began on 1 May 1971, when, as a geography student at the University of Tartu, I was finishing up fieldwork for my final project about the cliff waterfalls in northern Estonia. All of the falls were in the Soviet border zone, where special permission was needed to attain access, but one of the waterfalls in particular, the 23-metre Karjaoru falls in Saka, were situated directly next to a border guard station. The sale was made unattractive by the fact that the mansion’s ruins, along with a crumbling garage and an officers’ residence, were to be sold as movable property, i.e. without the surrounding land. Another problem was that the estate did not include a former Soviet watchtower, which was located in the middle of the privatized property. The building was, nevertheless, later acquired with the help of the Kohtla municipal government and integrated into the estate. The manor’s location in the most attractive part of a 1,200-kilometre limestone shore – the Baltic Klint – and the Estonian government’s plan to request the extensive landform to be granted the status of a World Heritage Site by UNESCO led to the idea of converting Saka Manor into a first-rate tourism centre for the visitors of the beautiful coastline along with all the services needed by tourists. It was an ideal chance to offer an exciting experience to both nature and culture enthusiasts. Renovating the crumbling mansion, polluted and overgrown estate and the neglected park, which had lain abandoned for a decade, required large investments and endless persistence. The restoration progressed one step at a time. In the spring of 2004, doors opened for the former officers’ residence, which had been rebuilt into a restaurant and the Saka Cliff Hotel. Next, the border guard watchtower on the edge of the steep rocky coast was converted into Meretorn, accommodating four seminar rooms. Then, the military storehouse was turned into a camping lodge with public bathrooms and washrooms for caravan tourists. Trails were built in the park and a parking lot was added for cars. 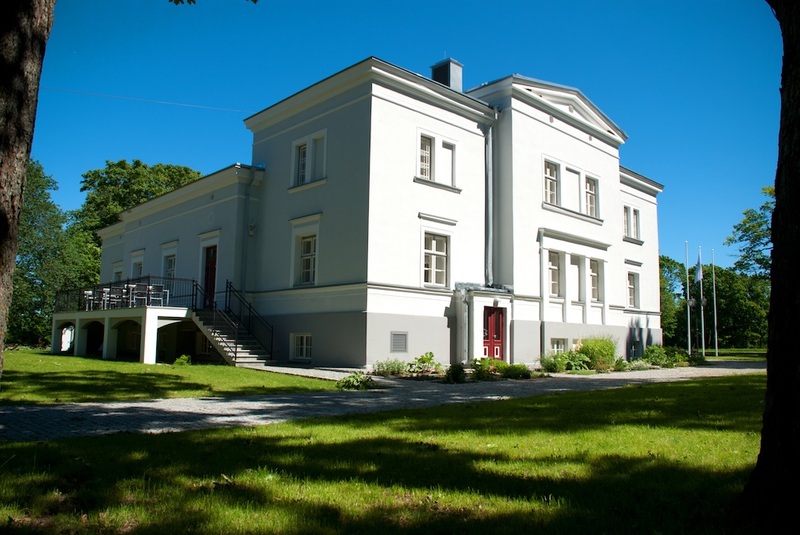 Finally, the restored mansion itself was reopened in 2010, for which Tõnis Kaasik merited honours as the National Heritage Board’s best partner in 2010 and Ida-Virumaa’s person of the year in 2011. Previously visible but intangible from the 50-metre-high limestone bank, the seashore and beautiful sandy beach were made accessible for holidaymakers with two stairways, which earned an award for one of the architects, Tiit Kaljundi. From the landing of the stairs, one can gaze into the interior of the so-called “Nordic rainforest”, with its broad-leaved trees and abundance of ferns. The unique Estonian forest type has been named Estonia clivosa of the Baltic Klint by a noted Estonian botanist Teodor Lippmaa. In subsequent years, the hotel was extended to include a wellness spa with a swimming pool; the gravel pit once used as a dump by the Soviet military was converted into an amphitheatre; and tennis and beach volleyball courts were built. Some military structures and trenches were restored as part of the Klindimõisa hiking trail. Thus the story of the rebirth of Saka Manor describes how a Soviet border guard outpost became the pearl of northern Estonia’s steep rocky shoreline.